no Dad, no "I love you first,"
my son, great love, my boy, my bright one. if I had died in Vietnam. Written on the inside cover of a book entitled "Nam, The Vietnam Experience," which I bought for my son Dorsey, who as a boy loved to dress in camouflage. J.E. Dorsey was my grandfather, my first inspiration as an artist, a violin maker in Houston, Texas, Jack Edward Dorsey died in 1980, but his name lives on in this pen name, which keeps his memory alive. I began using my own name in 2011 in much of my poetry. Doug Claybourne, writing under the pseudonym J.E. 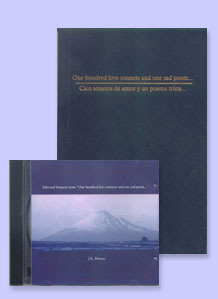 Dorsey, has written some twenty five books of poetry since 1995, only one of which he has self published in limited numbers. This published book is entitled One hundred love sonnets and one sad poem... It was given as a wrap gift following filming of The Mask of Zorro as it was written one poem a day for a hundred days. A CD entitled Selected Sonnets from "One hundred love sonnets and one sad poem... features readings of the poems by Gary Busey, Renee Estevez, R. Wayne Kruse, Zak Maloy, Mary Kay Place, Catherine Zeta Jones, Julieta Rosen, Glenda Silvey and Martin Sheen. The readings are accompanied by an original score created by the popular solo pianist Jim Brickman of Windham Hill Records. All of the artists donated their work for the project as proceeds from the package went toward a college education fund for six children in Mexico along with Dougs own two children.